If you do then Tall Emu CRM can help managed all aspects of the Product Management through to Shipment and Stock control in a way that matches your business needs and the type of product you are selling. 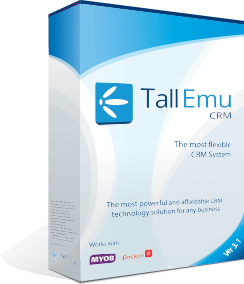 Tall Emu CRM supports a variety of products and product types out of the box. The variety of quoting methods allows you maximum flexibility in how you present your products and services to the world. The type of product anyone business sells can be quite different. For instance you may sell a finished product that is made up of various parts bundled together and sold as a complete product. Tall Emu CRM can be tailored to manage all the complexity that could throw up. The supporting imagery and properties of a particular product can be managed in CRM to be correctly use, updated and sourced from a central location. An item is a basic item that you would buy, quote or sell. A can of cat food, a shipping container, a garden shed. A physical item or service item. A variation is a way of grouping items. A striped mans shirt is available in several variations (small, medium, large) and each of the variations can be tracked with separate part numbers. A bundle (often called a kit) is a group of products. A mixed dozen bottles of wine. Top hat and tails. A bundle is made up of all of the other product types, and stock for the bundle is drawn from the general availability of other stock items. A manfactured item is a stock item that has a “recipie” – it is buit from other products – but can be held as an in-stock item in it’s own right. For example, a computer is built from hard disks, CPU and memory – and while you can have stock of the components, it is also possible to have stock of the actual end item. Virtual Products are Pseudo-stock codes that allow the same physical item to be sold several ways. For example, a 18″ car tyre may be the stock line that you sell, but your customer may buy “Tyre for Ford Falcon” or “Tyre for Holden Commodore”. Product options are stock items or services that can tailor an existing product or bundle. For example, you could purchase a Ford Focus with Auto or Manual transmission, Premium or Standard stereo – and each of these impacts the price. Any product in CRM can be stock tracked, stock takes handled, including unlimited locations worldwide (in a hierarchy if required) down to the bin location. Tall Emu CRM can track serialised products into and out of stock and over into it’s asset management system.